Building the Balanced Force Particle Model – Physics! Blog! This is the “Kick Dis” that I refer to as a “hover disc” in class. Click the image to go to a website where you can buy it. Something new! Let’s look at it! We decide that even if there is some tiny amount of friction when it is on, it is so small that we can model it as No Friction and still be able to make pretty good predictions. Could we model it as No Friction when it is turned off? Well, sure, but it would be a pretty terrible model and our predictions wouldn’t be very good. Okay, so there is definitely a line somewhere about when it is no longer okay to model a situation as having No Friction. Now this is a toy, and you guys are Big Kids. When you were Little Kids, you could play with toys without worrying about breaking them. So let’s just remember to be gentle. Okay, in a moment, not yet, I’m going to turn this back on and gently pass it across the floor to someone else. When it comes near you, go ahead and gently pass it on across the circle. It is easiest to observe when it is going somewhat slowly, so don’t speed it up too much. Gentle passes, guys. Okay, let’s go back to the tables and put together some new representations to describe what we saw. When we were looking at motion in the CVPM unit, we looked at intervals of time. With forces, we focus on one snapshot at a time instead of a duration. We had three diagrams that we could draw for CVPM, right? (x-t graphs, v-t graphs, motion maps) We’ll have three more for forces, soon. We’ll get to start playing with two of them today. The first representation is called a System Schema. There’s some space in your packet right inside the first page where you can draw your own diagrams. We’ll do four situations, and each of them will have two diagrams. If you want to plan ahead, just sort of mentally divide the page into quarters so that you have plenty of space. Our first situation is going to be this: The hover disc, turned off, sitting on the floor. No one is touching it. Snapshot. [Make camera motion with your fingers to emphasize the snapshot that you are taking.] Okay? Hover disc, turned off, on the floor. No one touching it. Snapshot. So a System Schema shows the objects that are interacting and what types of interactions they are having. What objects are interacting with the hover disc? [As kids start saying things, write objects on the board and draw circles around the names. If the kids don’t introduce enough random objects, start adding some of your own. You need way too many objects for this first system schema so that they start building an idea of what objects are minimally necessary.] Great. Final step. We draw a dashed line around the object or objects that we are focusing on. Any lines that cross that boundary are forces that are acting on the object. 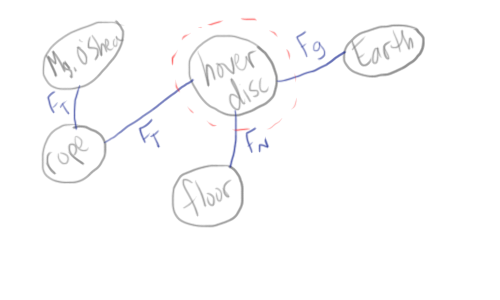 So how many forces are on the hover disc? (2) Great! Now, I think we had more objects in our schema than we really needed. 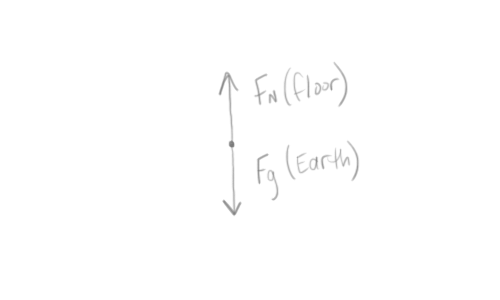 Which ones did we really need to have (Earth, floor). Did it hurt anything to have the extra objects? (Not really, no.) So as long as we make the correct connections, it’s okay to have extra objects in there. Once you’ve practiced a bit, you’ll usually be good at knowing which objects are the ones that are important to include. 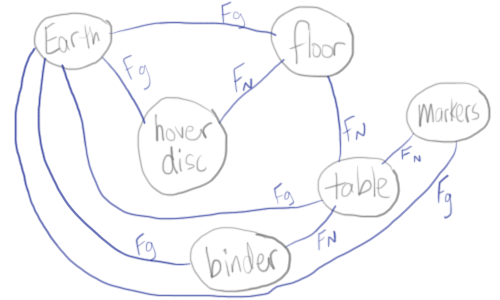 Once we have the system schema, we know all of the forces acting on the hover disc. The free body diagram is where you represent the object as a particle and show the forces on the object with their directions. Remember that we represented the object as a particle (a dot) on our motion maps back in CVPM. So. Shrink the object to a particle. And what’s one force acting on the hover disc? (Gravity) What direction? (Down) Down toward the center of the Earth. What object exerts it? (the Earth) We’ll write that in parentheses so we know what object exerts each force. Great. What’s the other force? 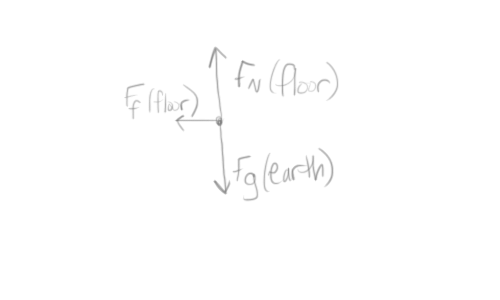 (Normal force from the floor) Crunchy force, great. What direction are the atoms being crunched? (Umm… perpendicular) Perpendicular to what? (To the floor) So that’s up or down, right? (Okay, up, because they floor is pushing up from underneath it.) So that’s it, yeah? Hey… does that look kind of balanced to you? (Yeah, I guess so) And what kind of motion was it? (At rest) So is that CVPM? (No… oh wait, yes.) Cool. Ready for the next situation? This is going to be our second out of four snapshots. Hey… does that look kind of balanced to you? (Yes) And what kind of motion was it (It was CVPM when we weren’t touching it) Cool. Ready for the third snapshot? Remember when I pushed the hover disc and it was no fun at all because it was turned off? (Yes) Okay, hover disc is turned off, I have pushed it, and it is moving, but I am no longer touching it. Snapshot. Got it? It is turned off, moving, but no one is touching it. Snapshot. Let’s shrink it down to a particle and draw the FBD. Hey… does that look kind of balanced to you? (No!) Oh, okay. So unbalanced, then. 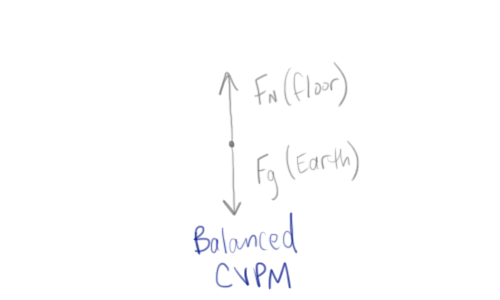 And the motion… was it CVPM? (No, it was slowing down.) Okay, so changing velocities. Hey… does that look kind of balanced to you. (No) And the motion? (It was speeding up.) Great. Whoa. That seems like kind of a big pattern. Is anybody else getting goosebumps here? 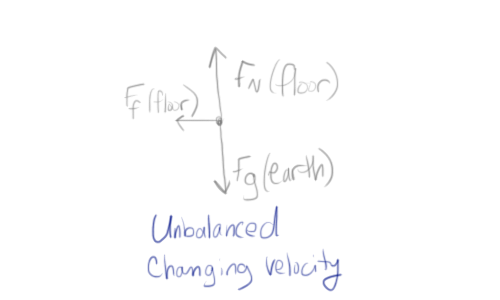 So balanced forces, constant velocity. 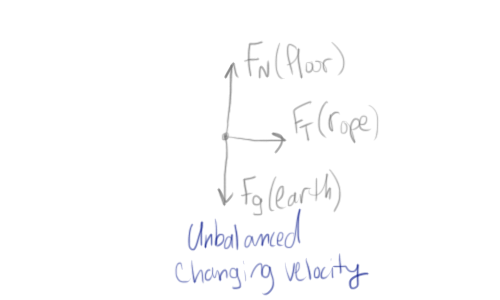 Unbalanced forces, changing velocity. That seems like a pretty useful pattern, actually. (Yeah) [Short pause while this sinks in.] Okay… would it surprise you guys to hear that someone else noticed that same pattern before we did? (No way!) [Shake fist dramatically.] Curse you, Isaac Newton, for being born hundreds of years before us! This could have been (Susie, or whatever the kid who said it is called)‘s Law! (Is this Newton’s 1st Law?) Yes, yes. That’s what people generally call it. There’s a space to write down Susie’s Law on the front of the packet. This work takes around 2 class periods (about 80 minutes). Before we do this day, I spend 25 to 40 minutes to get common vocabulary. We discuss English meanings of the word force, and I tell them “my” physics definition (an interaction between two objects). We define names, symbols, general directions, and cases where they are present for 4 or 5 common forces (gravitational force, normal force, friction force, tension force, sometimes also spring force). Without getting the common vocab first, it would be much tougher to do what I described above succinctly. 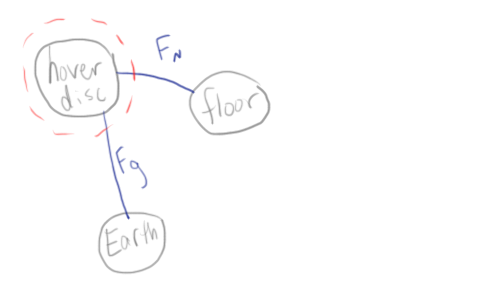 We also play a bit with a matter model and talk about the normal force in terms of atoms being crunched and the friction force in terms of atoms being sheared. I always call “strings” as “ropes” because string and spring sound too similar and we end up getting confused and frustrated at some point that way. Also, I didn’t come up with this paradigm investigation. It is basically the Modeling Instruction paradigm lab, I think. Awesome explanation, and it’s really easy to see how your class runs from here. I might even send this post to my kids if they’re looking for a refresher on these ideas. But I do have one question—I notice you say that the floor is exerting a force on the puck when the puck is on. Have you decided not to make a big deal out of the idea that the air is pushing the puck upward and it isn’t touching the floor? We spend some time drawing that idea out by sliding a piece of papaer under the puck when it is on to see that it isn’t touching the floor and this is why the frictional force goes away. What are your thoughts on that? Probably irrelevant details at the momemnt that just slow you down? It’s a good point. In some classes, they say it is the floor pushing on the bottom of the puck. In some classes, they say the air pushes on the puck and the floor pushes on the air. I just go with whatever they want because in this super early bit, it doesn’t really matter. And they don’t have the model yet, so whatever makes the most sense in that class is what they need in order to get toward seeing the pattern. Kelly, it is interesting how you get at the same ideas in a very different order than I do. One question: how do you motivate the existence of the gravitational interaction before building the balanced force model? (I do the no force model using dry ice in a similar manner to what you describe on day 1, then build both the balanced force model and the gravitational force idea on the next day by trying to reconcile the no force model with free fall and a mass suspended from a spring). No motivation needed. When I ask them what types of forces exist, I’ve never had them say anything but gravity as the first one. Interesting. It is usually a topic of some debate in my classroom. The idea that the downward acceleration is due to an interaction with some object is usually quite difficult for them. They throw out the word “gravity” very quickly, but usually what they mean by that doesn’t have to do with an attractive long-range interaction with the earth. Do your students have any trouble with that, or do you spiral back to it later? We do BFPM before we do CAPM. We don’t deal specifically with acceleration (and certainly don’t use the word) in this unit, though we do draw v-t graphs for objects that have unbalanced forces. The table on the front of the packet really helps, especially the What Direction and When Is It Present columns. They readily tell me that gravity is always present and points down (sometimes they even give me “toward the center of the Earth” without any prompting). They have a much harder time with Fg when it comes to the Fg you exert on the Earth. That’s a much harder sell. What I do for that is have a student hold a bowling ball in one hand and a basketball in the other. Which one does (s)he need to push up on harder to keep it in place? The bowling ball. Why? Because of gravity. Do you mean that something is pulling on it? Since “gravity” isn’t a real thing you can touch, what must be actually pulling down on the bowling ball? Earth. This idea came from Rutgers’ Physics Union Math inquiry-based curriculum. This confirms everything I’ve been reading this weekend about the method – I was having trouble finding the definition of system schema until planning today for tomorrow’s lesson. I’ve always introduced free body diagrams as the first step, but I can really see how this helps students develop one more layer of concreteness before jumping to the diagram. In the beginning I have students identify for every force that it is object _____ exerting a force on object _____ and require them to identify those two objects. It combats inclusion of net force as a force on a FBD doing this, but as you had mentioned in your commentary to me last week, it really helps in Newton’s 3rd. I love how drawing a system schema does this without even needing to mentally fill in the blanks of the sentence – drawing the dotted line around the object being analyzed in the schema does it almost automatically. Thanks for being so explicit in describing your process and in answering questions – it is a great help for teachers like me that want in on the action we’ve heard so much about from the modeling world, but are only beginning to understand or attempt. I found the system schema a little tedious at first, but it was because I already know how to draw FBDs. The kids find them really useful throughout the year, though, and now I love watching them draw one without being prompted when they know they are getting confused about which forces are acting on an object. Actually, they seem to love drawing them even when they don’t necessarily need them, but the more diagrams the merrier. It’s a great habit to have, drawing diagrams. I’m a beginning modeler and this post is SO useful. Thank you for sharing. How much total time do you spend on BFPM? I would be very interested to know your day by day schedule for this unit. Thanks, Ryan. I spend maybe two weeks on it in Honors Physics (sophomores), and maybe three weeks on it in my regular classes (juniors). I’ll try putting together a timeline soon to show you how we did it this year (just recently finished in the regular classes, but we’ve been done for ages in Honors and are halfway through unbalanced forces in one of my sections). A misconception is just an insight without a productive place to go? « Teach. Brian. Teach. Hi Kelly, Thanks for all the great modelling info. I’m curious about where you go from here. How do you use the Worksheet 1 Forces and Motion? If you don’t assign homework then do students just work on it sequentially in class? How does that work with whiteboarding? I don’t see how a group of students can WB #4 in the worksheet without having done #1-3 first. But do they all work on it together in class and then another day do the whiteboarding? It seems like a lot of class time but maybe it works. Thanks for letting me know. I do assign minimal homework (work on the next couple of problems to get ahead for tomorrow) during the month of September only (before I am expecting them to use their out-of-class time in a more individual way), which is when BFPM falls, so they do a little bit of working ahead in the packet on their own. Generally, though, we work through the packet during class in an “individually-together” sort of way (work the problem a little, talk to the other people at your table, argue some things out, work on your own a bit, confer with your table again, etc). Everyone always works through every problem that is being whiteboarded before we whiteboard it. With the first worksheet in particular, I usually do board meetings (everyone whiteboards the same problem, which isn’t the norm, then they have to reach a consensus before everyone whiteboards the 2nd problem, and on and on). I wrote more about how whiteboarding typically goes in this linked post. Compared to traditional, lecture-based classes, it is definitely a lot of class time. Compared to others using Modeling Instruction, though, I seem to keep up with them (or, often, go at a faster pace) even without assigning homework (having the students do the work of the class, productively struggling through problems, during our meeting times). Kelly, I read this post last year AFTER I introed FBDs, we never drew the Interaction Diagrams. So I decided to give it a try this year, and I like it for a lot of the above reasons people have stated. Two things I’ve run into during our discussion that I had to deal with. #1 When the disk is ON students immediately recognized that the disk is NOT interacting with the table (how could it? it’s not touching it.) So we included Air in our system diagram. I guess this is providing a Buoyant Force? But I didn’t use that language. My students agreed that that air is providing a Normal Force on the disk because the air particles are being “scrunched” together. Have you ever dealt with this? Any thoughts or ideas would be appreciated. Thanks. These are definitely both common things I’ve seen in my classes (both regular and honors). 1) This varies from class to class and year to year. I go with whatever makes sense to them. 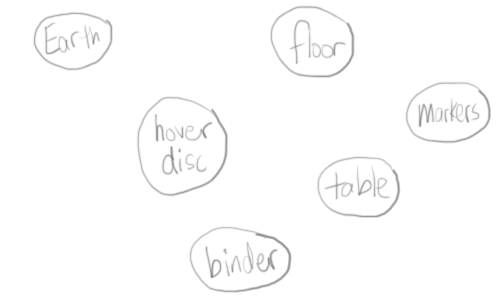 Sometimes they want the air to be considered part of the hover disc (so we write “+ air” inside the hover disc bubble on the system schema)—in that case, the floor is still exerting a normal force on the disc. Sometimes they want the air to be a separate object. 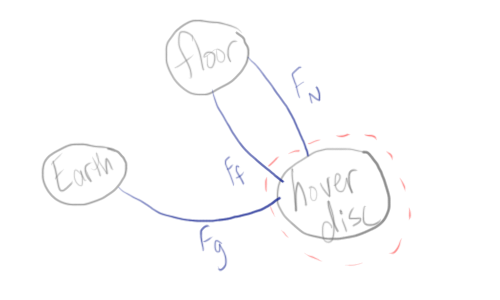 In that case, the floor interacts with the air (normal force) and the air interacts with the disc (normal force), but the floor doesn’t interact with the disc. Whichever they decide, they are usually pretty content with that. I don’t really offer it as a choice to them. I just sort of play it cool and see how they decide to tell me the objects in the schema should be connected. Either way, I don’t let on really that anyone has ever done it differently than how they’ve chosen. At that point, they aren’t quite ready to think about equivalent variations (since they haven’t even put together a full pattern yet). 2) This is really common and persists for a while. Usually, though, you can get the kids to start explaining to each other using the tools that they’ve developed to think about the forces. Since our definition for normal force is that it is present when the atoms are being crunched, it is pretty easy to get them to talk themselves out of a persistent Fn by thinking about whether the person is still crunching the disc’s atoms (etc). 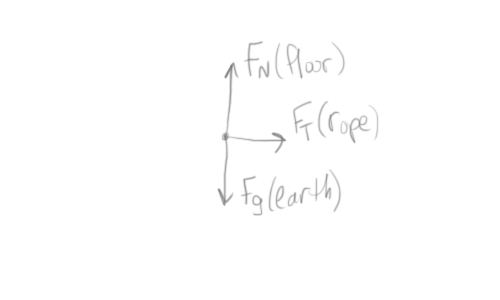 I never use objects as subscripts for forces. (So Fhand would not work in our schema.) I get them to relate it back to what particular flavor of interaction is happening, then what object is exerting the force. Since our definition for force is “an interaction between two objects”, the force can only exist if there is a second object interacting with the disc. These ideas won’t disappear immediately, but you can help them talk themselves through specific situations. Since the Aristotle in their gut is a lot stronger than the infant Newton they are growing in their brains, they need these tools (diagrams, definitions of forces, etc) as a structure to help them think through each case. Does that help? What do you think? Observational Markers that Force(s) are Happening | Teach. Brian. Teach. I’ll add my thanks and kudos for your efforts at sharing your style of instruction and MI with so many. You provide a great safety net for those of us who want to/are jumping into MI even though we haven’t made it to the summer training. Knowing you’re probably have a very busy year at this school and in spite of my awe at the level of detail you’ve provided, my question is this: Will the “Building the Newton’s 3rd Law” be coming anytime soon or is it on the “when I get to it” list?